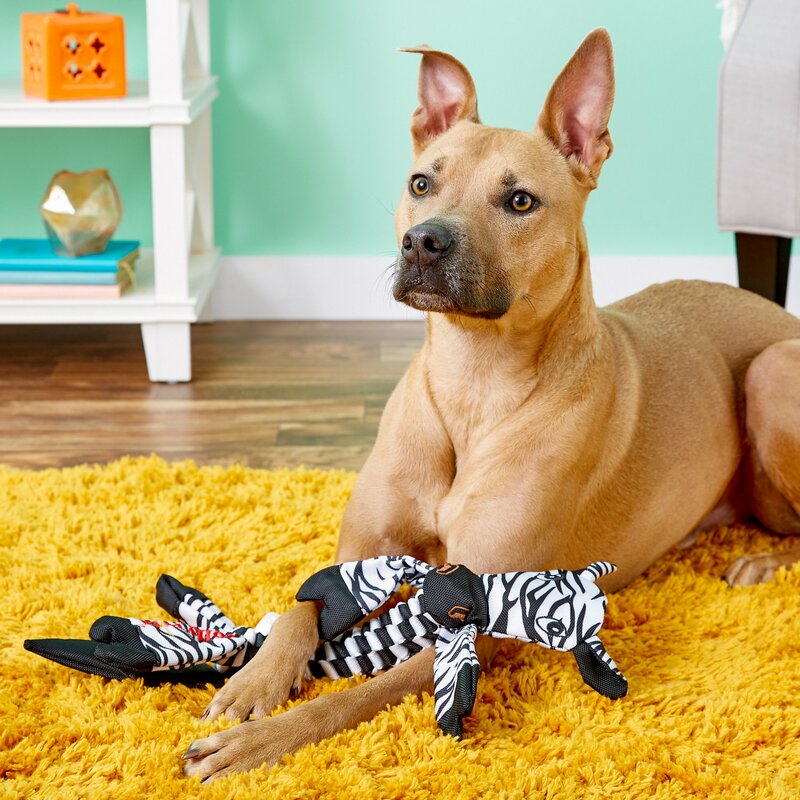 Jolly Pets Flathead Zebra Dog Toy is designed for hours of chewing, tossing and tugging fun. It’s a durable stuffing-free toy that’s great for a stress-relieving game of tug-o-war or just tossing around the house. The stretchy, weave body holds a built-in squeaker and also helps floss and clean teeth while chewing. Designed for hours of chewing, tossing and tugging fun! A durable stuffing-free toy made from non-toxic Cordura Nylon that’s great for a stress relieving game of tug-o-war or just tossing around the house. 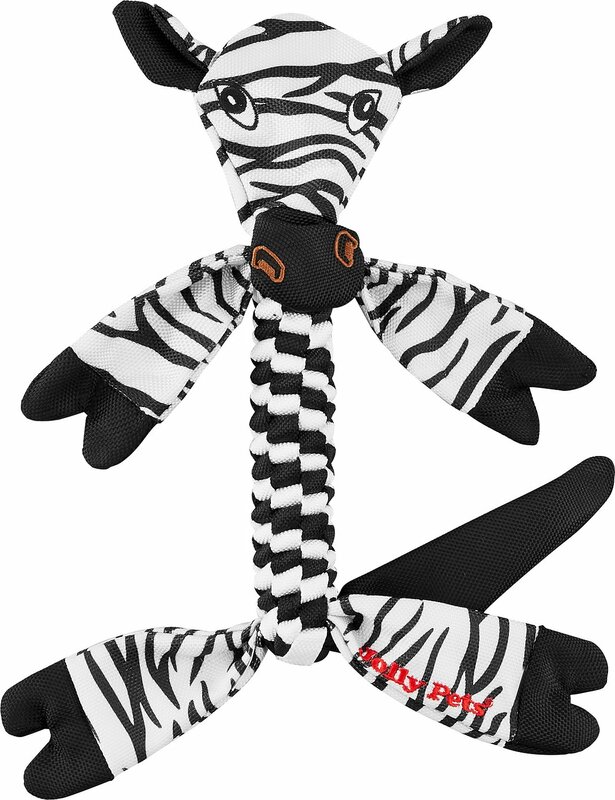 Stretchy, weave body holds a built-in squeaker and also helps floss and clean teeth while your pup is chewing. Squeaks and crinkles to give your pup a wonderful time and entice them to continue play time. Helps relieve boredom and stress, especially while you're away from home. TUG: Playing tug-of-war helps your dog relieve stress. So far, so good. Pretty durable and a good tug-of-war toy. this adorable zebra arrived today! I mistakenly thought since he was flat, the zebra had a better chance of surviving my 8 month super chewer black lab. Lucca was thrilled to get a new toy. Poor zebra was ripped and decapitated within 15 minutes. I guess bones are the only toy my puppy can have. Sadly no toy has lasted the wrath of Lucca. I have tried many toys this zebra's life span was shorter than the others. My dog tore this apart in less than a day and the fabric came apart in shreds and was a mess to clean up. I am always on the lookout for toys my young Scottie can't gut in 10 secs flat. This one is a great toy because it stretches which allows for fun games of tug and Rabbie can shake it as hard as he likes to practice his 'killing' skills! THIS ZEBRA IS A HIT! My 8 month old "killer" Berner absolutely loves this zebra. Unfortunately our golden hasn't found this toy to be very exciting. It sits in his toy basket.